The Rev. Dr. William Barber, the fiery preacher and leader of the Poor People’s Campaign, brought delegates to their feet with a message about race, politics, inequality and how America’s “rejected” and disadvantaged can turn the tables and take this country back. Rev. Barber explained that failed bureaucracies that leave communities with poisoned water, states that suppress voting rights and politics that play to issues that divide Americans are detrimental to our democracy and must be stopped. Racism. Gender discrimination. Militarism. Those are issues the powerful use to divide allies. Those are issues that caused supporters to turn against the Rev. Martin Luther King Jr., said Barber. And today those are among the issues that divide allies like labor and religious leaders. Barber was at the Vatican and referenced how the pope addressed why that kind of division must change. “He told all of us that even if you are in labor or in religion and you only deal with the next contract, but you don’t use your power to deal with racism and poverty, you have not fulfilled your calling by God to transform the world,” Barber said. The disadvantaged and poor make up the other America, Barber added. That is the America with substandard housing, poisoned water and little if any economic justice. But there are more of those “rejected” Americans than there are oppressors and it’s time for coalitions committed to the moral high ground to come together. “The rejected must come together … what we need in this country is a massive, nonviolent fusion. Civil disobedience. Mobilization. 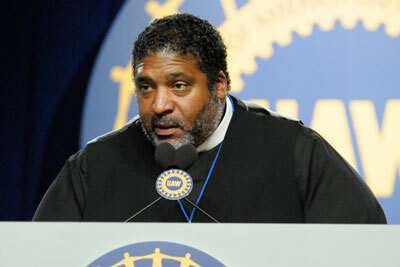 And, we need mass power-building among the poor and the working poor,” Barber told delegates. All images, text and graphics Copyright© UAW Region 8. No Reuse without written consent of UAW Region 8.